2016 Honda Accord VS 2016 Ford Fusion. Which Is Best? The Honda Accord and the Ford Fusion are two top-selling midsize sedans that are popular with buyers because they offer a winning combination of performance, fuel economy, roominess, and the latest technology. But which of these two outstanding vehicles is best when it comes to making the right choice for you and your family? Let’s take a closer look at both cars, pitting them against one another in a head-to-head competition to see which comes out on top. There are significant differences when you step inside the Accord compared to the Fusion. Honda claims to have engineered the new Accord “from the inside out” and it shows. The Accord uses its larger interior space (103.2 cu. in. compared to 102.8 cu. in.) better than the Fusion by a thoughtful combination of functionality blended with upscale appointments. The Accord pulls ahead of the Fusion when it comes to performance and fuel economy. The Accord’s 2.4-liter, direct injection 4-cylinder bests the Fusion with 185 horsepower and 181 lb.-ft. of torque compared to the Fusion’s 175-hp and 175 lb.-ft. of torque. The Accord weighs 261 pounds less than the Fusion, helping to improve fuel economy and handling. Combined fuel economy for the Accord with a Continuously Variable Transmission (CVT) and Eco-Assist is 31 mpg compared to 26 mpg for the Fusion. Plus, the Accord also offers a 3.5-liter i-VTEC V6 engine that generates an impressive 278 horsepower and 252 lb.-ft. of torque for power when you need it. By comparison, the Fusion’s 2.0-liter turbo only produces 231 horsepower and 273 lb.-ft. of torque. Additionally, the Accord’s larger 17.2-gallon gas tank gives you more range compared to the Fusion’s 16.5-gallon tank. You can travel approximately 32 more miles in the city and 23 more miles on the highway in the Accord compared to the Fusion. According to Edmunds.com, the MSRP of the 2.4-liter, 4-cylinder 2016 Honda Accord LX with CVT and the Honda Sensing™ driver-assist safety package is approximately $355 less expensive than the MSRP of the comparably equipped 2016 Ford Fusion SE 2.5-liter, 4-cylinder with 6-speed automatic transmission. Edmunds.com also reports that you could save up to $1,500 on gas (on average) compared to the Fusion. Another fact that should swing the vote toward the Accord is that it’s been named a Car And Driver “10Best” award winner a record 30 times. That’s right, 30 times. The Fusion? It didn’t even make the 10Best list in 2015. Speaking of accolades, there’s one other thing that the Fusion would be hard pressed to match and that’s reliability. Honda’s track record for building some of the most dependable cars on the road is legendary. In fact, according to a recent survey by IHS-Polk, Honda “is the most durable, longest-lasting brand for the past 28 years with 78% of all Hondas sold between 1990 and 2014 still on the road today.” The Fusion? It’s simply not been around that long. The bottom line? Despite the fact that the 2016 Ford Fusion has its good points, the Accord comes out the clear winner with a more powerful engine, better fuel economy, greater range, a lower price, fresh styling, and renowned Honda reliability. 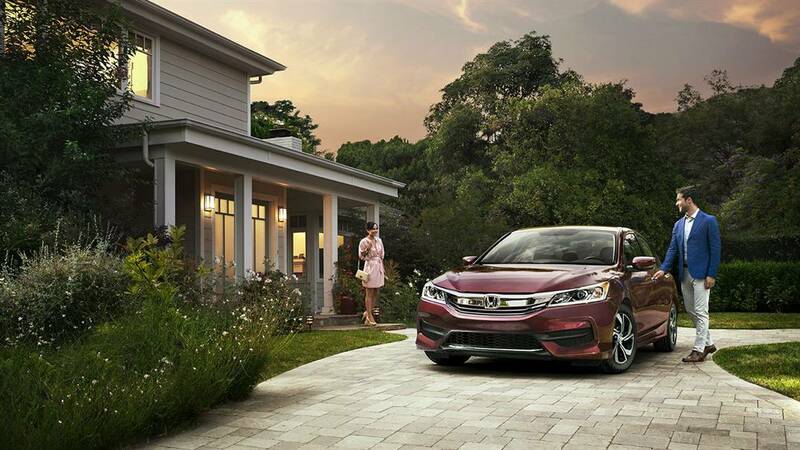 Discover the many reasons why the 2016 Honda Accord for sale in Phoenix is head and shoulders above the competition by test-driving one today at a conveniently located Valley Honda Dealer near you. Ask about dealer special offers and Honda factory incentives on our entire lineup of new 2016 Hondas for sale in Phoenix. You can also own one of our quality, “like-new” Honda Certified Pre-owned vehicles for less. So visit a Valley Honda Dealer today and come out a winner with a great deal on a new Honda.